Striking architecture, hearty food and the prettiest metro stations in the world are just some of the reasons Uzbekistan is a must-stop on the Silk Road. Travellers have been intrigued by the romance of this epic trading route for centuries and Joanna Lumley’s new TV programme on it is bound to pique more interest. Savvy agents can sell to a new generation of explorers, keen to follow in the footsteps of Genghis Khan, Marco Polo and Alexander the Great. The region has seen an increase in interest with tour operators reporting markedly increased bookings for their Silk Road tours. A number of high-end operators offering experiences in Uzbekistan say that the growing interest is down to improved infrastructure, a safe environment and the romantic associations of the area, with its thousands of architectural wonders and UNESCO sites. Independent from the Soviet Union since 1991, Uzbekistan has a history dating back millennia. Most tours start in the capital Tashkent, much of which was destroyed by an earthquake in 1966 but is now rebuilt. The Hotel Uzbekistan is a typical example of Soviet architecture, as is the city’s metro. Built in 1973, the subterranean system is thought to be the most elegant in the world. Adorned with mosaics, mirrors and chandeliers, each station is different. The highlight of any trip here is the breathtaking Registan Square in Samarkand, built between the 15th and 17th centuries. The three grand edifices here are among the world’s oldest. In its heyday the square would have been alive with activity as the whole city congregated here to talk, pray and trade. Also in Samarkand is the Ulugbek Observatory, a UNESCO World Heritage site. Built in the 1420s it is one of the finest observatories in the Islamic world. Uzbeks pride themselves on their unique cuisine, which is rich and hearty. Plov is the national dish and there are 14 different types. The dish is made with rice, meat (usually beef or lamb) onions, carrots and other vegetables, all cooked in vegetable oil. The cooking of plov is usually carried out by men, while women prepare flat breads which are baked in a special clay oven and often decorated with colouring and seeds. Although predominantly a Muslim country, the Uzbeks produce some exceptional wines. The colourful bazaars and markets in Uzbekistan are a shopper’s paradise. Lengths of brightly coloured fabric, silk rugs and scarves are piled up alongside beautiful ceramics and wood carvings. The colourful central bazaar in Samarkand provides a great window into Uzbek life. Pick up exotic spices and some disk-shaped, clay-oven-baked bread, which locals say lasts for up to three years! The first paper mill outside China was established in Samarkand in 751 and silk paper can still be found, made into books, bags and even little dolls. Clay figures, many with comical faces, are a common sight on pavement stalls. The best way to travel from Tashkent to Samarkand is by train. The Afrosiyob train runs seven days a week, taking two hours. There are ambitious plans to link all its 14 regions to the capital by high-speed train. Already running between Tashkent-Samarkand-Shahrisabz and Bukhara, in the near future Khiva will be also be connected by the fast train. National carrier Uzbekistan Airways is fast expanding its fleet and its network of flights to over 50 cities around the world is also to be expanded. Another option for UK travellers to the region is Air Astana, which flies direct from Heathrow to Astana, Kazakhstan, three days a week and connects onto other Central Asian nations. Moreover, the country is easier than ever to access following the new electronic visa system as well as a scheme allowing visa-free entry for up to five days while in transit. 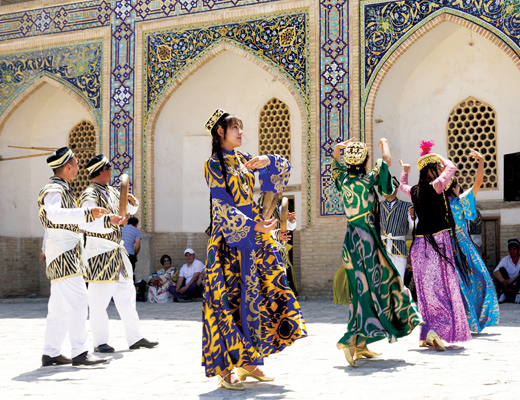 For 2019, Regent Holidays has put together a new itinerary combining Uzbekistan and Tajikistan. This is because the border between Samarkand in Uzbekistan and Penjikent in Tajikistan re-opened this year, making it easier for travellers to travel between the historical highlights of Uzbekistan and the Fan Mountains in Tajikistan. Bukhara: One of the world’s oldest cities, Bukhara is home to the Kalon Minaret. Genghis Khan was so taken with the 47-metre-high landmark, built in 1127, that he spared it while his troops ransacked the city. Khiva: In the sixth century the walled city of Khiva was a valued trading stop on the Silk Road. Now home to Uzbek families and businesses, its ornate mosques, mausoleums and madrassas have been painstakingly restored. Natural wonders: Uzbekistan has mountain ranges that offer some great skiing, along with waterfalls, rivers, lakes and deserts. Take a jeep safari through the Kyzyl-Kum and Kara Kum deserts and stay in a traditional yurt. Dancing displays: The Uzbeks never miss an opportunity for some music and dance. Women wear brightly-coloured costumes and headdresses, which sway as their movements become increasingly frenzied. Regent Holidays has a group tour to Uzbekistan and Tajikistan will depart on September 6 2019. Priced from £2,770pp, and based on two travelling, the deal includes flights, accommodation, all meals, all transfers and transportation, sightseeing with an English speaking driver/guide and entrance fees on sightseeing tours.